Imagine you're outside, walking happily on a beautiful sunny day. Suddenly, the light gets intense. You look up, and see a bright flash filling everything. Seconds later, a powerful wind starts pushing the clouds out of view at hypersonic speed. Buildings, trees, and people fly away, disintegrating into a billion pieces. Everything around you disappears and the sky is no longer blue, because the atmosphere has been blown away like a candle. Sadly—or fortunately—you wouldn't be able to see this spectacular show, because you would have been dead a few minutes ago. But some lucky scientists have been able to observe this very thing—or something quite similar—for the first time and from a safe distance, on a completely different planet than Earth. It happened to HD 189733b, an exoplanet orbiting a star 63 light years away from us. First, NASA's Swift telescope detected a furious X-ray flare from that distant star. Then, the Hubble Space Telescope observed as the nearby planet's upper atmosphere was blown away. The flare was just like the ones burped out by our Sun, but much stronger. 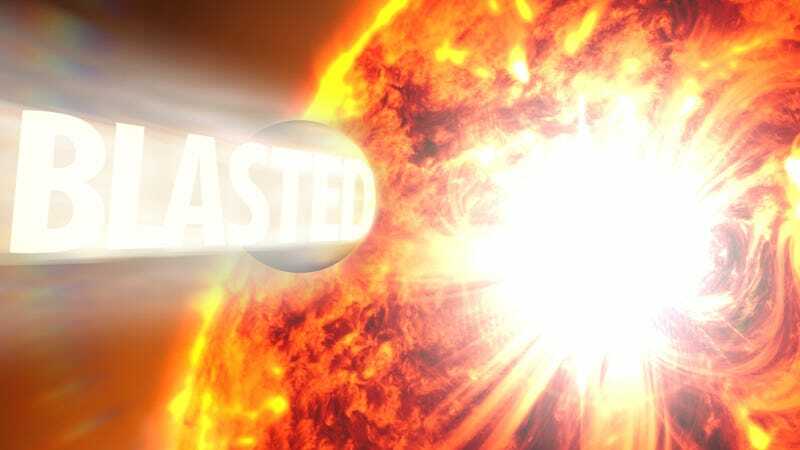 In fact, scientists calculate that the planet received "three million times as many X-rays as Earth receives from a solar flare at the threshold of the X class." In their observations, researchers found that at least 1,000 tons of gas were being ejected from the planet's atmosphere every second, with speeds that reached more than 300,000mph (482,803 km/h). What an amazing and frightening view this must be. According to lead researcher Alain Lecavelier des Etangs at the Paris Institute of Astrophysics (IAP), this is "an unprecedented view of the interaction between a flare on an active star and the atmosphere of a giant planet." This is HD 189733A, the star that blasted this planet. It's 80 percent the mass of our Sun. The star's X-ray emission blowing off the planet's upper atmosphere. Of course, that exoplanet is nothing like Earth. It's what astronomers call a hot Jupiter, a giant gas planet 14 percent larger than our own one-eyed neighbor. Inside the planet's deep atmosphere the temperatures reach 1,900 degrees Fahrenheit (1,030 C). But unlike our Jupiter, this one is so close to the star that can get affected by the star's flares.